Hey guys! If I misspell anything in this post, please forgive me – I'm in the back seat of a car, typing on my phone! There is a whole NEW SEASON of Victorious coming your way. We just finished shooting 15 new episodes, and they're amazing. If you love Victorious, I feel sure you'll love the NEW episodes coming! By now, a lot of you have heard that Victorious will not be returning for a 4th season. That is true. I would love to have made more than 60 of Victorious, but that's how it usually goes. Whenever I begin a new TV series for Nick, 60 episodes is the plan, from the beginning. I've heard some people use the word "canceled" – which isn't accurate in this case. The term "canceled" is usually used when a TV show gets poor ratings, causing the network to end the show early. TV shows that aren't doing well get canceled. Ratings for Victorious have always been very high (still are), thanks to the FANS. Also, just last month, Victorious was nominated for three Emmys. 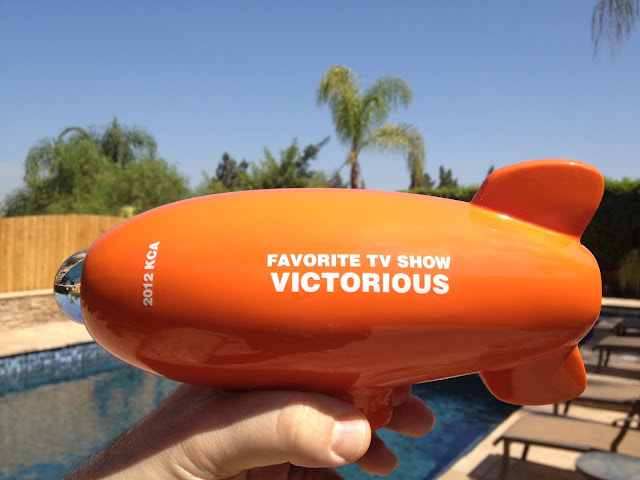 And just before that, Victorious won the Kids Choice Award for Favorite TV Show (see pic below). We're all extremely proud of the show, and all we've accomplished. Also – and it's really important that you know this – the network's decision about Victorious had nothing to do with "Gibby" or "Sam & Cat". I promise. Even if there was no "Gibby" and no "Sam & Cat" – the network still would have ended Victorious after its 60-episode run. I know that some of you are upset and angry – and while I feel terrible about that, I'm also flattered by it. I really appreciate that you care so much. It means you love the show, which makes me feel very proud. Remember: Stay psyched about the 15 new episodes of Victorious coming your way! And I hope you'll continue to support me, and all the stars of Victorious. I can almost guarantee you – they will make a big impact on the future of entertainment. And finally... of course... I will keep making the best, funniest TV shows I know how to make, for as long as people have fun watching them. I'll see you online later, and I'll try to answer some of your questions. For UPDATES on Victorious, iCarly, and BUZZ about my NEW SHOWS COMING SOON... please follow me on Twitter by CLICKING HERE!